The road construction industry faces a shortage of naturally occurring gravel materials that meet the requirements for base or even at times sub-base quality. This situation is exacerbated in some cases by the occurrence of mica in soils. This is reported to significantly affect the engineering properties of materials, including plasticity index and compacted density. The objective of this paper is to investigate the influence of mica on the unconfined compressive strength (UCS) and volumetric changes of a cement-treated gravel material. Free mica (muscovite) was added in predetermined percentages by mass to neat gravel (G5) and specimens subjected to a series of standard laboratory tests. The results show that UCS of greater than 3 MPa is achievable by stabilising less than 5% mica content gravel material with at least 4% cement. 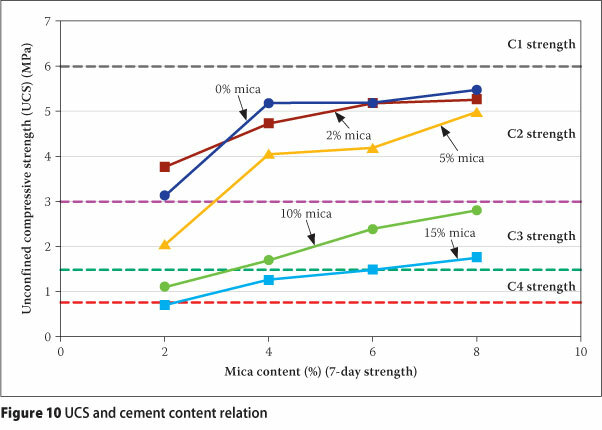 Mica content beyond 10% results in very low UCS, even for cement content greater than 6%. The road construction industry faces a shortage of naturally occurring gravel materials that meet the requirements for base or even at times sub-base quality. Construction economics, social and environmental factors surrounding sourcing and haulage of suitable materials at times justify the stabilisation of local material with additives such as cement. However, suitability of soil for stabilisation depends on factors such as grading characteristics, chemical and mineralogical composition, as well as conditions under which they occur on site. Natural gravel materials vary in nature, composition and properties depending on their geological formation and weathering environment. The content of free mica minerals in gravel, particularly muscovite, is reported to significantly affect such engineering properties as plasticity index, compacted density and strength (Tubey & Bulman 1964; Stewart et al 1971; Weinert 1980; Balogun 1984; Gogo 1984 and Clayton et al 2004). This problem has been reported in several countries in Africa, for example Ghana, Nigeria (Gogo 1984; Gidigasu & Mate-korley 1980), Zimbabwe (Mitchell et al 1975), South Africa (Paige-Green & Semmelink 2002) and Malawi (Netterberg et al 2011) where some road projects traverse micaceous soils. Mica is a phyllosilicate mineral with a common basic crystal structure, platy morphology and perfect basal cleavage (Fleet 2003). Micas are broadly classified as true micas that include minerals such as muscovite and brittle micas that include biotite. True micas are platy and highly elastic minerals that have been reported to influence the Atterberg limits, density and compactability of road building soils, whereas biotite is known to have less effect on the engineering properties of the soil (Weinert 1980). Micas occur in igneous rocks, such as granite (containing 2% - 5%), sedimentary rocks and certain metamorphic rocks, such as mica schist, gneisses and sandstones (Harvey 1982 and Dapples 1959). Literature review revealed that a limited number of studies have reported the quantitative effects of mica on the unconfined compressive strength (UCS) of the cemented gravel soils that could assist in contextual assessment and deciding whether to consider stabilising micaceous gravel soils for use in base or sub-base layers or not. Ballantine & Rossouw (1989), TRH 14, TRH13, and DoT (1993) state that if mica can be easily seen, the quantity of mica is likely to cause problems and the soil should preferably not be stabilised. Weinert (1980) suggests that soils containing more than 10% of mica, especially muscovite, should be avoided for use in pavement layers, whereas Mitchell et al (1975) recommend that, where materials are adjudged to be very micaceous, the acceptable plasticity limits should be lowered by 33% besides meeting the strength specifications. Weinert (1980) notes that mica affects soil properties such as liquid limits, plastic limits, density and compaction ability. Casagrande (1947) points out that micaceous soils have substantially greater liquid limit than a similar soil without the mica. Mitchell et al (1975) also reported that the presence of mica reduces the apparent plasticity as measured in the Atterberg tests, but increases the effective plasticity, making the material weaker and difficult to compact. In a study on the influence of decomposed mica schist on compaction and strength of major soil groups in Ghana, Gogo (1984) found that the presence of mica at about 13.5% contributed to the relatively low compaction densities and the high sensitivity to moisture changes. Ballantine & Rossouw (1989) state that compaction problems associated with micaceous soils are due to the springy action and high water demand of the mica mineral. Tubey & Webster (1978) concluded from their investigation on the effects of mica on physical properties of china clay sand as a road-making material that the resilience of mica plates reduces the degree of compaction achievable for a given compaction effort by about 0.007 Mg/m3 and 0.12 Mg/m3 per one percent of fine (<0.425 mm) and coarse mica, respectively. A study of micaceous sandy silts by Tubey & Bulman (1964) showed that the relation between soil strength in terms of CBR and equilibrium moisture content was relatively poor. CBR values of the micaceous soils at the same compaction effort, but from different climatic environments, affected the established correlation between California Bearing Ratio (CBR) and pavement thickness. The soils are noted to be permeable, and their field strength rapidly reduces by entry of water. Gogo (1984) notes that predicting CBR strengths of soil with mica content greater than 13% and at moisture content greater than 15% could be quite difficult. Clayton et al (2004) carried out experiments on a mixture of sand and mica and demonstrated that the addition of 10% or more of mica by mass leads to suppression of any dilation, high levels of pore pressure during shear, and low un-drained shear strengths. In addition, it was noted that the mica particles significantly prevent close packing of the sand particles, resulting in a drop in void ratio and a decrease in dry density. SANRAL (2004) recommends that crushed stone base aggregates containing mica, such as granite, mica schist, pegmatite and sandstone, shall not contain more than 2% by mass of free mica, especially muscovite, when assessed by visually separating the particles, or more than 4% by volume when assessed by means of microscopic slides. Cement is recommended for stabilisation of micaceous material in order to improve the material strength, as well as suppress the effects of mica on the plasticity index and compacted density (Mitchell et al 1975; Stewart et al 1971). Cement stabilisation is also reported to reduce swell and increase the soaked CBR strength of the material (Gidigasu & Mate-korley 1980). Stability of highly micaceous soils is achievable with cement or lime stabilisation. However, Tubey & Bulman (1964) pointed out the need for comprehensive laboratory and field tests in order to relate actual performance of the highly micaceous soils in road construction to the results of laboratory tests. Limited information is available that show a trend relation between occurrence of free mica in percentage by mass of gravel material to strength of the stabilised material. Reports are available (Netterberg et al 2011) that link failure of road and airport pavements to occurrence of mica, but limited information exists that relate percentage by mass of mica cement content and field performance levels. In view of the above, the objective of this paper is to investigate the influence of mica on the unconfined compressive strength of cement-treated weathered granite gravel material. Other strength-related properties, such as compaction, are also investigated. In addition the effect of mica on the volumetric changes of the cement-treated gravel is investigated. This study used dry ground muscovite sourced from Phalaborwa mines, G5 weathered granite gravel (potentially problematic with less than 0.5% free mica content) from Midrand quarry, fresh CEM II/B-V 32.5R Portland fly ash cement from Pretoria Portland Cement (PPC) Ltd, and tap water. UCS is the main criterion for assessing suitability of the treated gravel material for use in base and sub-base layers (TRH 14, 1985). Thus, two variables (mica and cement content) were considered to influence the UCS, and hence the use of a factorial design for the experiment was adopted. Difficulty in establishing reliable percentage of naturally occurring mica content in soils has been reported by several researchers (Tubey & Bulman 1964; Weinert 1980: Gogo 1984). In this regard, controlled addition of a known amount of mica to a regular gravel material was considered in order to eliminate this problem and ensure that variation in mica and cement effects are not overshadowed by other factors. Free mica was added to G5 gravel material in predetermined percentages of 0, 2, 5, 10 and 15% by mass so that subtle trends in the effects of the mica content on UCS and other properties could be investigated. 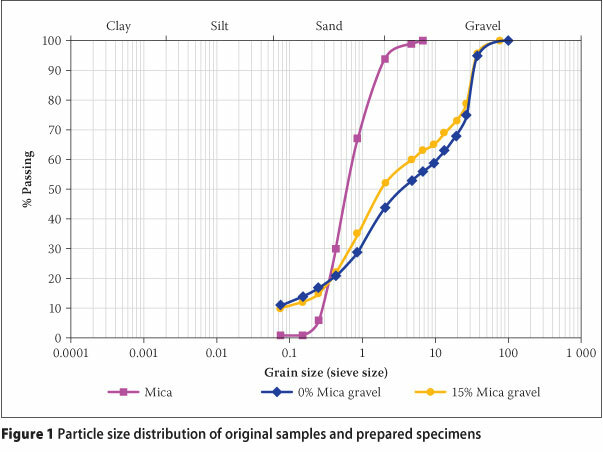 Figure 1 shows particle size distribution of free mica, neat gravel and the prepared specimens. Based on the ICC (2% after one hour) of the gravel material 2, 4, 6 and 8% cement was added and then each specimen was compacted to 100% Mod AASHTO density. Specimen preparation and testing were conducted in accordance with the standard methods of testing road construction materials (TMH1 1986). Table 1 shows the Atterberg limits and linear shrinkage for 0, 2 and 5% mica content gravel. Difficulties in determining reliable Atterberg limits for 10% and 15% mixes were noted, and hence not recorded. Similar difficulties in the replication of Atterberg limits results were also reported (Tubey & Bulman, 1964; Ruddock 1967). The results in Table 1 show that the addition of mica reduces the PI from 7 to NP, and hence confirms cement as an appropriate stabilising agent for all the specimens. Figure 2 gives selected scanning electron microscope (SEM) images of gravel and mica samples. Gravel particles are noted to be cubical and with rough faces, whereas mica particles are noted to be platy and with very smooth faces. Figure 3 shows an SEM image of a compacted sample with high (15%) mica content and schematic presentation of the gravel particles and mica plates during the compaction process. It is postulated in this figure that the platy mica particles restrain smaller gravel particles from filling the voids in the coarse gravel particle fabric. This could be one of the reasons for the difficulties reported by many in compacting high-mica content gravels. Stabiliser demand of each micagravel design mix was determined using the modified DoT (Department of Transport) method (Netterberg 2007a & b). Initial consumption of cement (ICC) was averaged as 2% in light of the reasonably constant readings being obtained at pH greater than 12.4. Maximum dry density (MDD) and optimum moisture content (OMC) were determined as 2 154 kg/m3 and 6.2% respectively. All compaction specimens were prepared using minus 19 mm gravel, with greater gravel particles crushed and mixed in and compacted using Mod AASHTO compaction effort. Figure 4 shows that the addition of 10% mica reduces compacted density by almost 5% from 2 154 kg/m3 to 2 069 kg/m3 and increases OMC from 6.2% to 8.3%. It is interesting to note that the 10% mica gravel has high soaked CBR values at moisture content less than 6.2%. At optimum moisture content (OMC), neat gravel had a CBR of 60% at 95% Mod AASHTO compaction effort. This confirmed the TRH 14 soil classification of G5 for the neat gravel sample. However, at 100% Mod AASHTO, the material had a CBR of 101%, which is well above the CBR of 58°% for 10°% mica -gravel compacted at the same energy and moisture content. 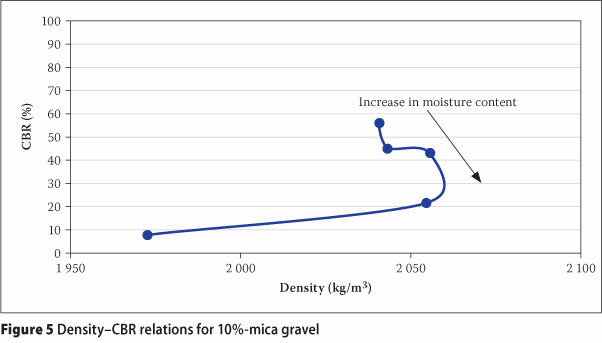 This suggests that the addition of 10% mica to neat gravel results in a drop in soil strength, and by extrapolation this material could probably be G6 quality material at 97% Mod AASHTO density. 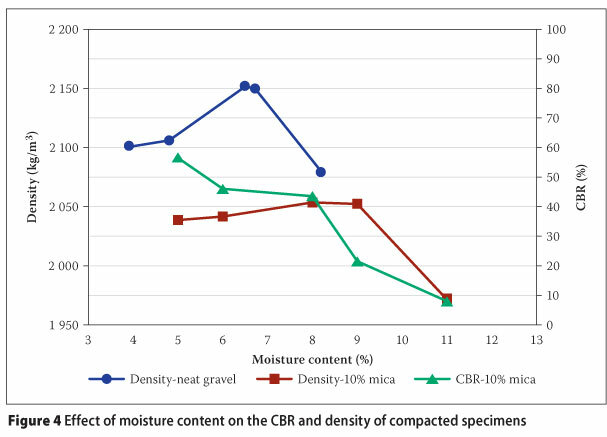 Figure 5 shows the relation between dry density and CBR strength of the specimen compacted using Mod AASHTO effort. Indications are that the CBR strength of the 10% mica -gravel decreases with increase in moisture content despite the increase in dry density. As is evident from the SEM, the specimen with more than 10% by mass of free mica particles does not stack in flat face to flat face, but rather randomly crisscross in the voids and between the larger granite soil particles. The flat surfaces of mica plates, together with the crisscrossing packing in the gravel particles fabric, result in increased void ratio and ability of the soil to absorb more water and reduce gravel particle interlocking and friction force at contact points. It is thus important to control moisture content during compaction of micaceous gravel materials. Table 2 gives volume changes of the compacted specimens before and after soaking for four hours of seven-day and 28-day cured specimens. Figures 6 and 7 show percentage changes in volume before and after soaking the specimens for four hours. 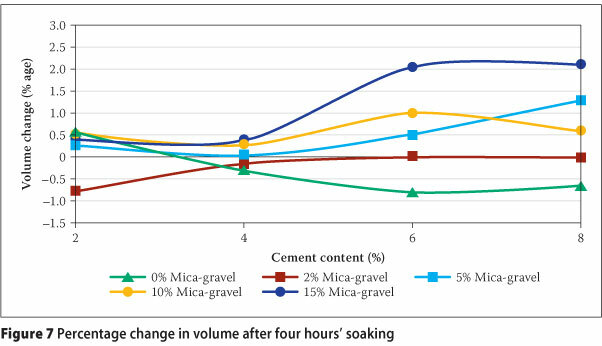 The figures show that an increase in mica content at all levels of cement content results in expansive volumetric changes. Specimens with less than 10% mica content and 6% cement content recorded less than 1% volumetric change for seven-day specimens. However, it is interesting to note that specimens containing 15% mica content and 6% cement content or more expanded by more than 1% of the original volume. With the exception of the 15% mica content, the general observation of the volumetric changes is that there is minimal change in volume of the specimens after soaking for four hours, regardless of the increase in mica and cement content. This implies that, after the initial volume change that occurs soon after extrusion of the specimens, the compacted specimens attain stability against volume change in response to variation in moisture conditions. This may be as a result of cement hardening, binding the soil and mica particles together. Table 3 provides a summary of average UCS results for seven-day and 28-day specimens. Analysis of the variance of the data in the table indicated significant influence of mica and cement content on the UCS values. 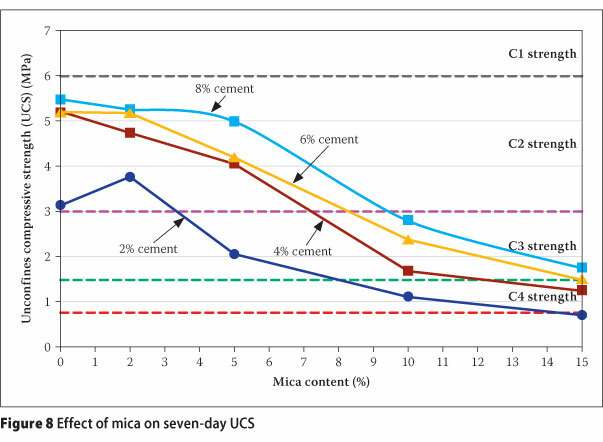 Figure 8 presents the relation between mica content and UCS for seven-day specimens at different levels of cement content. The design strength class indicated on the graphs does not in any case classify the treated material, but rather gives an indication in UCS range in which a specific material falls. Figure 8 shows that the addition of 2% mica content results in an increase in strength of 2% cement content specimens by almost 1 MPa before the UCS drastically drops at 5% mica. It is considered that small quantities of mica fill in the void spaces between gravel particles, thereby increasing the dry density. In addition, SEM images show that mica tends to align itself to flatter faces around the larger soil particles, which may suggest that a smooth mica surface provides a plane over which adjoining soil particles slide during compaction, resulting in an increase in density and UCS. For mica content less than 5%, an increase in mica content results in a minimal low unit rate of reduction in strength of specimens, as evident from the flat plot lines. However, the steep slopes of plot lines for mica content greater than 5% indicate the greater negative effect of mica on UCS. The effects of inherent properties of free mica on the weathered gravel are noticeable at mica content greater than 5%. However, as was shown in Figure 1, it is noted that the addition of free mica changed the particle size distribution of the specimens to some extent, particularly for <2 mm particle size range. Particle size distribution has an effect on the engineering properties of the road building materials. This aspect of material properties was not further investigated in this study, but has been taken into consideration when analysing results from specimens with different amounts of added free mica content. The effect of mica properties, at 10% mica content and above, on the material strength dominates over the binding effect of as high as 8% cement content. Figure 8 also shows a wide gap between UCS plot lines for 2% and 4% cement content for mica content less than 5%. This implies that 4% cement content gives the best UCS gain, and further addition of cement results in less increase in UCS per unit percentage of cement. Figure 9 shows UCS plot lines for 28-day specimens. An average of 5.5 MPa was obtained for 4, 6 and 8% cement content, giving an increase of almost 1 MPa over and above the 2% cement content UCS. 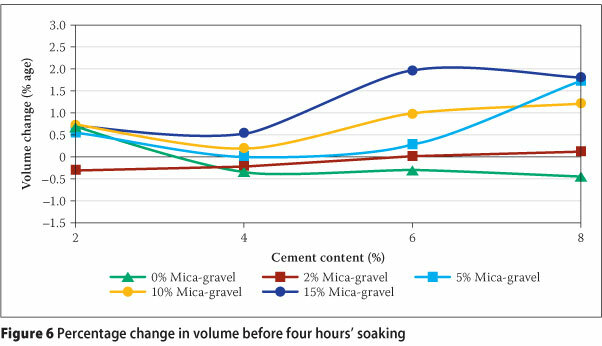 The flat gradient of plot lines implies that the addition of 2% mica has no effect on 4 - 8% cement-stabilised specimens. However, 2% mica negatively affects the strength of 2% cement content specimens. This indicates that optimum gain in strength is obtained at 4% cement stabilisation of gravel with less than 2% mica content. Furthermore, Figure 9 shows a drastic drop in UCS of specimens with mica content greater than 2% and stabilised with 4% cement content. It is thus noted that 6% cement content provides constant UCS for as much as 5% mica content gravel. Further increase in free mica content beyond 5% results in a drastic decrease in UCS for all levels of cement content. This gives an indication of serious potential problems in strength that could be associated with soils with greater than 5% free mica content. Comparing strength plot lines in Figures 8 and 9, it is noted that there is a substantial and steady decrease in strength of the 5% mica content gravel stabilised with 4% cement from 4 MPa for seven-day to 3.4 MPa for 28-day. Without further investigation, it can only be speculated that the cause of the drop in strength could be that at content greater than 5% the properties of the elastic, smooth-faced and flaky mica dominate over the physical properties of the minus 2 mm component of the soil fabric (in-fill) of the original neat granite gravel. This also triggers questions as to the performance and durability of the treated material with time and under traffic loading. 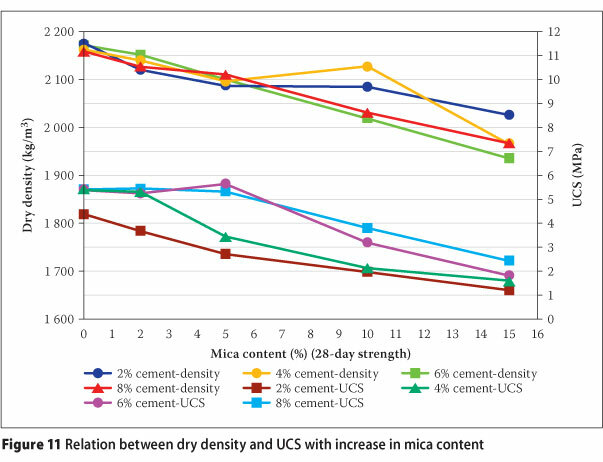 Figure 10 shows the relation of cement content on seven-day UCS for 0, 2, 5, 10 and 15% mica content specimens. UCS results for 2% cement content give an indication of the quality of original micaceous gravel. The low strength achieved at 2% cement for all levels of mica indicates the failure of cement to suppress the effects of mica and improve the strength of the material. This relates well with the results from ICC tests that indicated 2% cement content as the minimum requirement for modification of the material, and not strength gain. 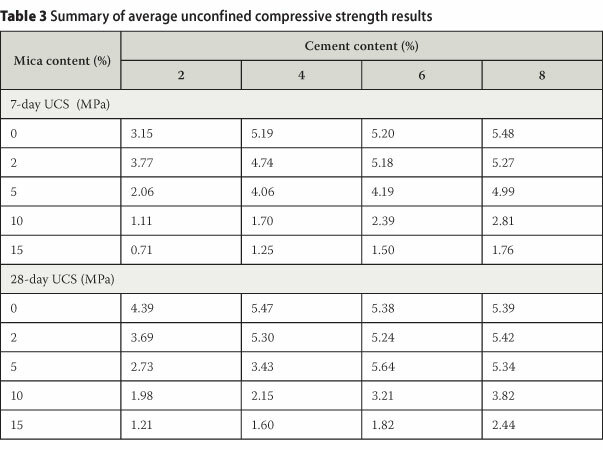 Figure 10 also indicates that at 2% cement and less than 5% free mica content the treated material achieves the C3 design strength, and even C2 for 4% cement content. The addition of more than 4% cement to less than 5% mica content gravel material yields less rate of gain in UCS. The strength gain difference between 5% and 10% free mica specimens, when compared with the difference between 10% and 15% free mica specimens, is an indication that the influence of free mica is pronounced for free mica quantities greater than 10% free mica content. This concurs with most researchers who have cautioned against stabilisation of road building materials with free mica content greater than 10% by mass. The results confirm that, with gravel with 10% or more of mica, one achieves insignificant gain in UCS, even at a cement content greater than 8%. TRH 14 (1985) recommends that design UCS should be obtained with no more than 5% by mass stabiliser at optimum OMC and specified density in order to guard against the use of unnecessarily high and uneconomic stabiliser content in cemented layers. It follows then that use of cement as the only stabilising agent for the gravel material with greater than 10% free mica content is not a feasible option. Alternatively, further investigation that combines cement stabilisation with other stabilisation could be considered as possible options. F-test of 97.7 against F critical value of 4.7 obtained from testing for significance of the regression and a coefficient of determination (r2) of 0.92 indicate the high confidence that one can place in the model to predict UCS as a function of mica and cement content. This high confidence level in the model is applicable to the weathered granite gravel and laboratory specimens used in this test, and hence one would need to recalibrate the model if it is to be used on materials different to ones used in the study. It is evident from Figure 11 that increases in mica content result in decrease in compacted dry density and decrease in UCS. It is interesting to note that the specific gravity of mica plates is about 2.8, but this is compromised by the high void ratio in the compacted material and the difficulty to compact the material as mica content increases. At 10% mica content, the 2 and 4% cement content specimens had higher density and lower UCS than the 6 and 8% cement content specimens. This means that UCS at 10% mica content is mostly governed by strength derived from cement-hardening, as opposed to density and interlocking of the compacted material particles. However, indications from Figure 11 are that a combination of increase in density and cement content could give better increase in UCS for a given mica content. ■ Increased mica content results in significant and steady decrease in UCS of the specimens at all levels of cement content. However, less than 2% free mica has no negative effect on the strength of the compacted material. ■ Reasonably high UCS strength (>3 MPa) of less than 5% mica content gravel can be attained with 4% cement content and higher. Mica content greater than 5% results in a drastic decrease in UCS, regardless of the cement content applied. ■ Seven-day UCS greater than 1.5 MPa is obtainable for less than 10% mica -gravel with at least 4% cement content. Thus, it is feasible to stabilise micaceous weathered granite gravels (<10% mica content) to base strength for lightly trafficked roads using between 4 and 6% cement content. 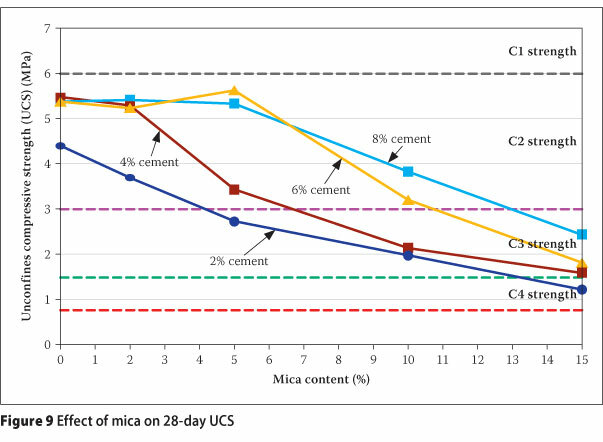 ■ Increase in free mica content beyond 10% results in very low UCS even for cement content greater than 6%. The results suggest that stabilising a free mica content gravel of greater than 10% to obtain strengths for sub-base and base layers might not be viable. ■ Increase in mica content up to 15% caused less than 2% volumetric increase. This is a marginal change in volume to warrant concerns regarding density rebound effects. Increase in volume caused by plus 10% mica content overshadows shrinkage usually associated with cement-treated material. We would like to acknowledge the guidance provided by Dr F Netterberg and Dr P. Paige-Green, and provision of muscovite by Ingwe Mica Industries, cement by Pretoria Portland Cement and gravel by Afrisam. Furthermore, the technical assistance and laboratory facilities provided by the CSIR are acknowledged. MICHAEL MSHALI obtained a BSc In Civil Engineering at the University of Malawi, and a BSc Honours and MSc (Transportation Engineering) from the University of Pretoria. He worked for Mphizi Consultants in Malawi for nine years. Currently he is Principal Associate at Tshepega Engineering (Centurion, South Africa), working as Senior Design Engineer (Geometries) since 2009. His field of expertise includes road and airport pavement engineering, road geometrics and traffic engineering. This paper is based on research that was a topic of his Master's project report. ads committee in 2006 for lifelong services rendered.